The Scroll of Esther and Hag Purim: Disturbing history or dramatic literature? 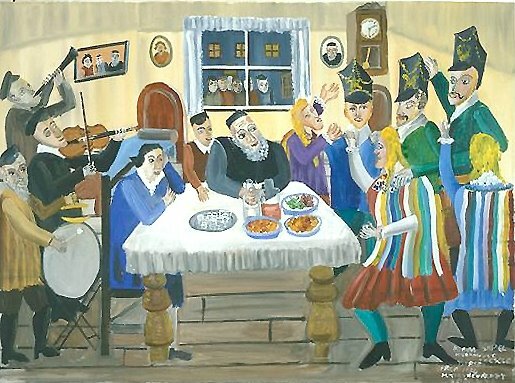 A few years ago, when I was working as the education director of a small synagogue, I was assigned the task of preparing the Purim celebration. I started hunting around the Internet for an abbreviated version of Megillat Esther (the scroll of Esther), which I would divide up and email to our volunteer readers before the spiel. The scroll in its original form was much too long, and I was hoping for an easy way of cutting it down. 2:3: The King’s attendants sweep the countryside looking for “virgins” to add to the King’s “harem”. Esther didn’t so much “win” a beauty pageant as be forcibly selected and “taken” to the King’s palace. 7:8: When Esther reveals to the King that Haman’s edict to kill all Jews means she too will be killed, it appears that Haman tries to sexually assault her. Haman is then sent to the gallows and hanged. 9:6: The Jews of Shushan kill 500 men, and then a few verses later, Haman’s 10 sons are hanged at the gallows. It might bring you comfort to know that no serious academic believes there is any historical truth to the events recounted in Esther. The narrative, which takes place in the time of the ancient Persian empire (539 BCE – 333 BCE), is rife with chronological problems, which are too numerous to list. Furthermore, no evidence of the key events of the story has ever turned up in biblical or extrabiblical sources, including from Persian literature, much of which has been preserved. The author of the book does show some familiarity with details of life in the Persian empire. The author knows, for example, about its size, its postal system, and a considerable number of details about its court life (3:13; 8:10). The story uses a number of words and a few names of indisputable Persian origin. But there are other parts of the story that contradict what we know about Persia, or simply strain credulity. Esther herself is a historical improbability. According to Herodotus (3:84), the Persian king could only marry within seven noble families, and there is no reason to think any of them were Jewish. There is no evidence for the existence of 127 provinces or satrapies (1:1; 8:9) in Persia. It doesn’t make sense that a decree go out in a multitude of languages, when the only language spoken was Aramaic (1:22, 3:12, 8:9). And how could a banquet last 180 days (1:1-4)? Etz Hayim We is a wonderful resource for an adult education group that is interested in spending a few weeks engaged in a close text study of Megillat Ester. Visit http://www.jrf.org for more information.